They are both young, dynamic politicians. They both quickly rose through local politics through the US Senate to campaigns for the White House. They both exceeded expectations to make headlines in the Iowa caucuses. And there the similarities between Marco Rubio and Barack Obama end. Rubio’s last-minute surge on Monday to a close third place in the Republican contest in Iowa, closing ground on the winner Ted Cruz and on Donald Trump, brought comparisons with Obama’s victory eight years ago over Hillary Clinton. But Rubio 2016 is not Obama 2008 — not because of differences between the two men, but because of the differences between their parties: a Democratic Party which was recovering to take the White House months later, and a Republican Party which is fractured and scrambling to get control of this year’s campaign. Although he was part of the Democratic establishment in 2008, Obama was an “insurgent” candidate against Clinton, who was thought to have both the record and the machine to roll to the nomination and victory in November. The Illinois Senator’s rhetoric, a well-crafted tour with Oprah Winfrey, and the use of social media propelled “Yes, We Can” and “Hope and Change” into the challenge to both Clinton and the Bush Administration. 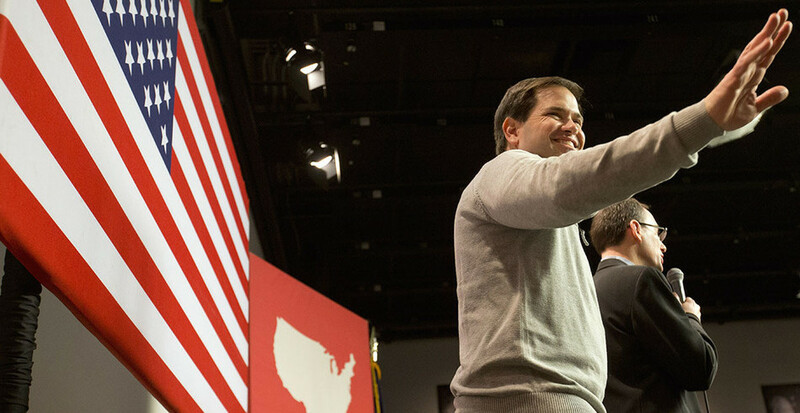 This year’s Republican contest — and thus Rubio’s position — is far different. Perhaps for the first time in modern history, a party has two insurgents and no establishment favorite. The rise of Donald Trump’s candidacy was the initial shock. It is not just Trump’s aggressive outsider persona that unsettled the GOP. It was also policy, or rather the lack of it: the tycoon’s slogans may offer shock social recommendations, from Mexicans to Muslims, but they provide little for economic policy or an approach to foreign affairs. Seasoned Republican operatives have been wondering how they punch back at a campaign with no substantial recommandations to be hit. But then came the shock of the second wave. Trump’s redefinition of the campaign opened the space for Ted Cruz, the US Senator from Texas, whose own reputation for strident rhetoric was tempered by the bombastic style of The Donald. Given the opportunity to portray both his Washington experience and his challenge to the GOP’s leadership, Cruz built on his base support from the Tea Party and evangelical Christians. Meanwhile, the Republican establishment was floundering. Its likely flag-bearer, Jeb Bush, was performing so badly in polls and on the campaign trail that plans had to be questioned and possibly abandoned. Selection of an alternative was complicated by the crowded field of candidates. And then there was the albatross of the “Washington insider” label: for one brief moment last autumn, the top three hopefuls in polling — Trump, Dr Ben Carson, and Hewlett Packard CEO Carly Fiorina — all had the distinction of never being elected to public office. The Republican leadership had a serious problem. Neither Trump nor Cruz is believed to be a strong candidate against Hillary Clinton in November. Presidential elections are not decided by die-hard supporters but by the majority of Americans in the “center”, including those who profess no allegiance to either party. While the GOP’s insurgents could mobilize their enthusiastic crowds, they would struggle to attract those preferring a more inclusive approach to politics. For weeks before Iowa, I expected the GOP establishment to put its weight behind Rubio. But the signs were not apparent: while anti-Cruz ads began to spread in an attempt to check his rise, the US Senator from Florida languished at about 13% in the polls, far behind the two front-runners. Either his campaign was failing to take advantage of his anointment, or the Republican’s nominee-makers were still uncertain about allying behind a single candidate. Those doubts were assuaged on Monday night. Because it almost doubled expectations, Rubio’s third-place 23% was an important victory, coupled with the dent in Trump’s failure to meet his own objective of a poll win. While Cruz had reason to be buoyant after his 28% won the caucuses, the Republican mainstream benefited from the calendar: New Hampshire Republicans are far more likely to be swayed by economic views rather than evangelical sentiment. The significance of Iowa was immediately apparent in a rush of endorsements for Rubio, including two from Senators and two from Representatives. For the first time, he is the best-supported candidate amongst the GOP’s top politicians, surpassing Bush’s collection of endorsements from last summer. Now Rubio has to consolidate the position with the appearance of Presidential credibility. In New Hampshire, the test is to finish second to Trump, who still has a healthy lead in polling. Success would likely close off any hope by other aspirants — Bush, New Jersey Governor Chris Christie, and Ohio Governor John Kasich — to confirm the backing from the leadership. There will still be a long way to go. Rubio, whose positions on key issues have sometimes appeared vague amid a campaign led by Trump’s insult-driven approach, will need to establish how his economic policies are a solid response to Clinton’s likely declaration of stability under the Democrats. He will have to give substance to a foreign policy which has lacked definition behind the mantra of “national security” and the threat of the Islamic State. He will have to show how his vision of American society is as inclusion as the Democratic “big tent” hailing changes in attitudes about African Americans, ethnic groups, and gays and lesbians. Beyond all this, Rubio will somehow have to hold together the different factions in the GOP, from the religion-first supporters to the social conservatives to the economic pragmatists to the now-overshadowed “moderates”. Outside of the special circumstances after 9/11, once one Republican campaign since 1992 — George W. Bush’s “compassionate conservatism” in 2000 — has succeeded in establishing that unity to win the White House, and even that was a shaky victory. Obama took that insurgency — even if it was an insurgency that was not that far removed from the Democratic machine — all the way to the nomination. Marco Rubio has to find that hope, but it is a hope which will be posed against the insurgents at the GOP’s door. Whether he and the Establishment able to keep them out will not only be important for this campaign cycle — it may define whether or not the GOP is beset by its own battles beyond 2016.